Fact: I’ve seen The Last Five Years about 42 times in various theatres around North America including the movie version starring Anna Kendrick. Also a fact: I absolutely love this little musical two-hander and never get tired of it. I saw the original production back in NYC while it was still relatively unknown and have followed its evolution ever since. When I had the opportunity to review the Lower Ossington Theatre’s version, I naturally jumped at the chance. How can you go wrong with a beautifully written show (composed and written by Jason Robert Brown) and a talented cast? Victoria Scully (Cathy Hiatt) and David Light (Jamie Wellerstein) are killer performers with mega singing chops. They burst out of the gate from the very beginning and only get better as the show progresses. I found the pacing of their character’s evolution to be just right; building slowly and going out with a bang. I have to give these actors some serious credit. Like me, they’ve probably seen and sung the show (or various bits of it) thousands of times (either to themselves, in the shower or at auditions) but still very much make it their own. This production uses pre-recorded music tracks. Personally, I used to hate singing to them because it can sometimes feel limiting; not allowing you to alter cadence or tempo at your speed or impulse, but Scully and Light found ways of sneaking in nuance every chance they got. I appreciated that and it’s a testament to their skill as singers and actors. 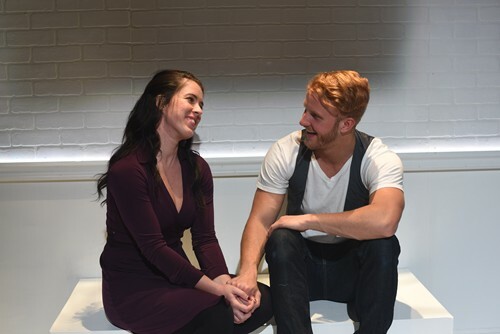 The production, directed by Heather Braaten, is really simple and pared down. The space is small with the audience on either side of the playing area but I thought it was used quite well. I loved the use of the white sheet in each scene as a sort of “common thread” throughout. What people may not know, if they haven’t seen the show before, is that the two story lines travel in different directions. Cathy Hiatt (a struggling actress) and Jamie Wellerstein (a successful novelist) are illustrating the story of their relationship and ultimate demise over the course of five years. Cathy’s storyline is told in reverse chronological order (beginning the show at the end of their marriage), while Jamie’s is told chronologically (from the beginning of their relationship.) This may be hard for first time audiences to follow but Braaten tried to keep it clear throughout with her direction. There are times where the actors are solo on stage, singing to the other character who isn’t there. I can see how this can be symbolic and perhaps it was directed this way so when we do get to see the two characters together the pay off is greater, but there were a couple of moments where I wish Braaten would have placed the other actor on stage. In particular, during “See I’m Smiling”, “The Schmuel Song” and “If I Didn’t Believe In You”. Those songs are all pivotal in the story and although it’s not a deal breaker, it would have been nice to SEE the two characters together, to witness the chemistry in those key moments. The Last Five Years is a show that moves along quickly and keeps you engaged throughout. The audience at The Lower Ossington Theatre seemed to be enjoying it a lot, as did I. This is the 43rd production of The Last Five Years I’ve seen for a reason. It’s a great show. So skip the movie version and see it live with two talented actors at arms reach. Bring some tissues. There are a lot of identifiable moments that can get you a bit teary!